Today I’m here to help you decode the mystery and wonder around indoor cycling shoes or spinning shoes. Do I need cycling shoes for indoor cycling? Why are cycling shoes better than regular shoes? What clips should I buy? What’s the best cycling shoe to get? My friends, read on. Do I need cycling shoes for indoor cycling? First off, if you’re taking indoor cycling classes more than once a week – buy yourself some shoes. I’m not saying if you have never tried indoor cycling before that you need shoes before your first class. However, if this is something in your weekly workout regimen, and you can make it work financially, the investment is well worth it. Bonus: they will last you a very long time. Some boutique studios, like Flywheel Sports, have shoes available for you to use because they recognize the difference this will make in your results. Why are cycling shoes better than regular shoes? Take out a pair of your tennis shoes, cross-trainers, or running shoes and see what happens when you try to bend them around. Pretty malleable right? All of these shoes are designed to be pliable in different ranges of motion that make it comfortable for you to walk, run, or jump all over the place. I can bend the toes of my Nike bionics to touch the heel – which is awesome for burpees, jump squats, and plyometrics – but if you’re doing those on an indoor cycling bike… you’re going to have more problems than just choosing shoes. Cycling shoes have a smooth, rigid sole made of composite or carbon fiber. 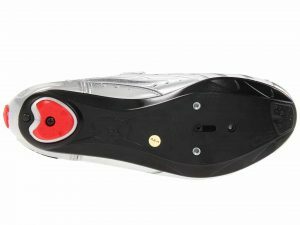 The stiffness of the shoe allows for more energy transfer into the pedals. This is also why cycling shoes will last years when running shoes have to be replaced every few months. In addition, cycling shoes allow you to pull up on the pedal, which allows you to generate more power and work more muscles. Who doesn’t want to work more muscles? What clips should I buy? First off, call your studio and ask what type of clips the bikes use. Most gym bikes will only allow for SPD clips on their bikes – no need to read further. Do I want to be able to walk around in the shoes easily? Do I want to be able to clip in and out easily? 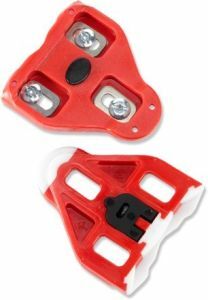 SPDs are small clips and therefore are sometimes difficult for a beginner to clip in. On the other hand, if you want to be able to walk around in the shoes, this is the clip for you. LOOK clips are larger and easy to clip in. They also provide a large surface area to push against, which some people prefer. The downside is you cannot walk around in these shoes on anything but rubber flooring. 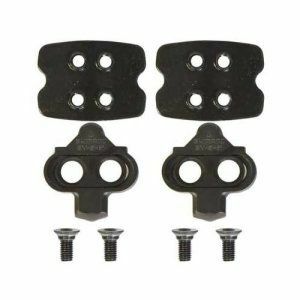 WARNING: There is a different clip called “LOOK KEO” – these look exactly the same as look delta, but they are SMALLER and will NOT fit into most indoor cycling bikes. Danger, Will Robinson, danger!! Oh my, can you just tell me what shoes to buy already? Shoes generally cost between $100-400. You can chose how much to spend depending on your budget and how often you will use the shoes. Shimano is a GREAT brand were you can get a shoe around $100. 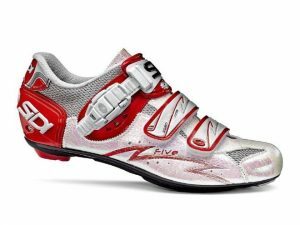 Sidi is a higher end brand used by triathletes, which will usually cost you upwards of $200-300. I personally use Sidi’s exclusively, but I wear the shoes for over 10 hours a week! Remember clips are sold separately. Feel free to send an email on the contact page with any other questions!